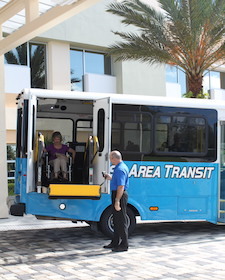 Space Coast Area Transit operates ADA Paratransit services to serve the mobility needs of those who are unable to utilize fixed routes by providing wheelchair accessible ADA Paratransit vehicles, which carry passengers throughout Brevard County on a daily basis. View the Rider’s Guide for Special Services, a public transportation rider’s guide for eligible seniors and transportation disadvantaged, including origin to destination Paratransit Service and ADA Paratransit Service. ADA Paratransit is generally an origin to destination service accessed through a trip-by-trip reservation. Space Coast Area Transit provides such services in order to meet the needs of the citizens of Brevard County. Purchase passes online now. 1-Ride ADA Paratransit Fare is paid when boarding. Exact change is required, as the driver is not equipped to make change. ADA qualified passengers ride at a 50% discount. 1-Ride ADA Paratransit Fare is $1.50. A 10-Ride ADA Paratransit Pass is $15.00 and must be purchased in advance. At Space Coast Area Transit, 401 S. Varr Ave., Cocoa, Florida, 32922, or 460 S. Harbor City Blvd., Melbourne, Florida, 32901. Fixed route bus passes may also be purchased at select Brevard County Libraries. The intent of ADA is to ensure that persons with disabilities have equal access to public transportation. Space Coast Area Transit expects that many disabled individuals will be able to use the regular bus service since it is fully accessible. Disabled individuals who cannot use Space Coast Area Transit bus service because of their inability to get around on their own. Disabled individuals who cannot use Space Coast Area Transit bus service because it is not yet accessible for their needs. When the bus service is accessible, disabled individuals who are able to use it will no longer be eligible for ADA service. A personal assistant accompanying an ADA eligible individual rides for free. Such an assistant is considered a mobility aid. One traveling companion accompanying the ADA eligible rider. Additional traveling companions are permitted only if space is available without displacing a disabled rider. Companions pay the same fare and must have the same pick up point and destination point as the ADA eligible rider. ADA eligible riders from anywhere in the United States may ride the service when they are visiting Brevard County. WHAT IS SPACE COAST AREA TRANSIT REQUIRED TO DO UNDER ADA? Space Coast Area Transit must make its regular bus system completely accessible for use by people with disabilities. This includes putting wheelchair lifts on buses and adding features for people with hearing and vision impairments. All Space Coast Area Transit buses are wheelchair accessible. WHAT ARE ADA PARATRANSIT SERVICE REQUIREMENTS? ADA level service must be comparable to the level of bus service provided by Space Coast Area Transit. This means that ADA service must be provided wherever the regular bus service operates and during the same days and hours. A person can call the day before a ride is needed to request a trip. Trips can be requested up to 14 days in advance. Trips that occur on a regular basis do not need to be reserved each time. Fares can be no more than twice the regular bus fare. Trips can be requested for any purpose. An eligible person’s access to ADA service cannot be limited by patterns of refusals, unusually long trips, late pick-ups or other such factors. HOW DOES THE ADA PARATRANSIT SERVICE DIFFER FROM TRANSPORTATION DISADVANTAGED (TD) SERVICE? First, individuals must apply and become certified by Space Coast Area Transit to become eligible to use ADA Paratransit. Secondly, ADA Paratransit’s service area is only for pickups and destinations within 3/4 mile of a Space Coast Area Transit fixed route. This is because the service hours for ADA Paratransit service correspond with the fixed route service area. In all cases, the current level of TD service will not change. DO CURRENT TD RIDERS HAVE TO REGISTER FOR ADA SERVICE? Yes! Only individuals who go through the ADA registration process and become eligible will receive ADA level service. If an individual applies for ADA service and is refused, he/she can call the Space Coast Area Transit at 321-635-7815 for information on the appeal process. For questions regarding eligibility or to make a reservation for ADA Paratransit service, call 321-633-1878 and ask for a Paratransit Representative. South Mainland residents call 321-952-4672. E-mail us!